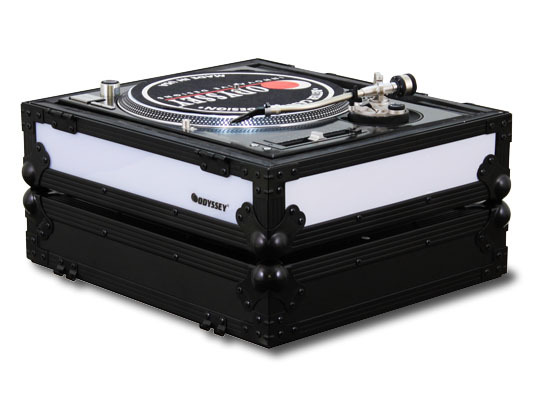 Odyssey FFX2RBM1200BL Flight FX2 Series Battle Mode Turntable Case DJParts - All Variety of Parts that DJ Needs. The ordinary has become extraordinary with Odyssey's new Flight FX™ case series. Flight FFX2 Series cases have two color changing multi-mode LED panels embedded into the side and front lower walls of the case. The panels can be set to any one of seven colors or at a variety of color changing modes. You can even connect control boxes of multiple Flight FX™ cases using cad 5 cables to synchronize the LED effects. Each Flight FX™ Series case is constructed with the same black anodized and powder coated black hardware as our Flight Zone® Black Label™ cases complimenting the visual aura of the glowing panel. Use the FFX2RBM1200BL in conjunction with a left side LED panel FX2 case (FFX2LBM1200BL), and a FX mixer case (FFX10MIXBL, FFX12MIXBL, FFXGS10MIXBL, FFXGS12MIXBL, FFXGS10), or create other various FX setup combination for the ultimate DJ showcase. Innovating? Of Course! Another Spectacular original Odyssey Design. Just excellent!!! • Can Also be Set-Up in Standard DJ Position with LED Panels at the Front and Left Side.